Sometimes it's fine to make an intuition-based decision as long as the costs of being wrong are acceptable. In God we trust, others must bring data. All those quotes are certainly correct. Having data is great. Using data in decision-making is smart. But. And this "but" is related to human nature to absolutise everything. Once decided to be data-driven, we tend to apply that approach to every decision we're making. Even when the costs of the process are greater than the best possible impact this decision could bring. In our example you're a new product owner is a company. You are responsible for a little area of a product. Your next task is to decide the positioning, colour and shape of a button on a page. - Perfect case for an A/B test, - says your boss. And so you start A/B test preparation. You spend 2 hours writing a hypothesis. 1 hour discussing it with engineers. 2 hours analyzing the impact on other A/B tests currently running. 6 hours collaborating with designers and UX to come up with variants. Another hour to finalise the plan with your boss. A couple of hours to QA and release the test. Finally, it's running. But. Numbers come in so slowly. Turned out your page is not that popular and the traffic is low. So you wait almost 3 weeks until you have significant results. Results show the following picture: 100 people came to your page. 25 preferred option A, 35 - option B and 40 went for option C. Ok, so results are not conclusive. And you already spent a month doing that test. Instead of continuing the test, you look at the bigger picture. Turns out the page you tried to optimise is among the least visited. It is insignificant in the context of the whole product. You can substitute this page with a picture of your dog, and it wouldn't affect the rest of the product. And if it would be a picture of your cat - you could even increase your traffic. You realise that you spent a month worth of work to make a worthless decision. Instead, if you'd know the costs of being wrong with this decision - you'd not waste so much time. Next time faced with a product decision, try the following exercise. Having answers to those questions - think whether the costs of actions justify the impact. Say a base value of a thing you work on is a virtual 100. A best positive impact is 20 and costs of actions (to increase your confidence) = 100 - you may want to go for it. But. If a worst negative impact is 20 and costs of actions (going with your intuition) = 10 - this might be the better option. Keeping in mind, it could mean positive impact as well. The trick is that both negative and positive impacts are potential. While costs of actions are real. We never could be fully confident about the potential impact. But very often the costs of being wrong are much smaller than the costs of actions to increase our confidence. You must know your operational costs. You should have an idea about an impact (both positive and negative) your actions might cause. 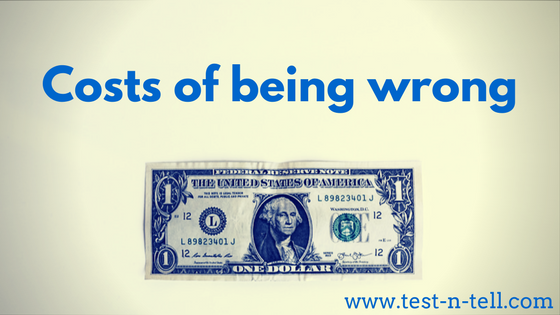 Knowing the costs of being wrong could speed up your decision-making, freeing up resources for really important choices. If we have data - let's go with it. If we only have opinions - let's go with mine. Knowing the costs of being wrong, this quote no longer just sounds cocky but could be a better way of making certain product decisions.